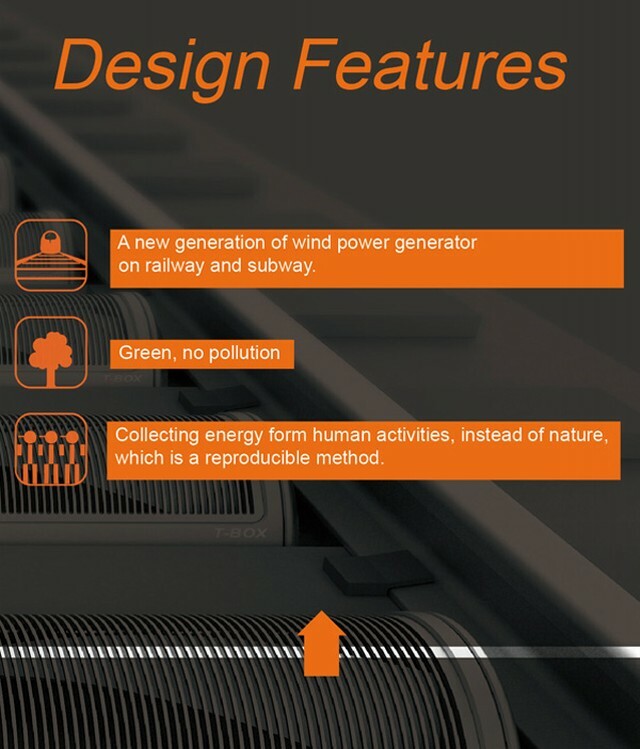 T-box is a power generator that harnesses wind-energy when a train moves across the tracks. T-box is composed of mechanical components required for supplying, harnessing and storing the converted energy. The generated power can be provided to remote areas where there are not any sources of electricity and public facilities along the railway. 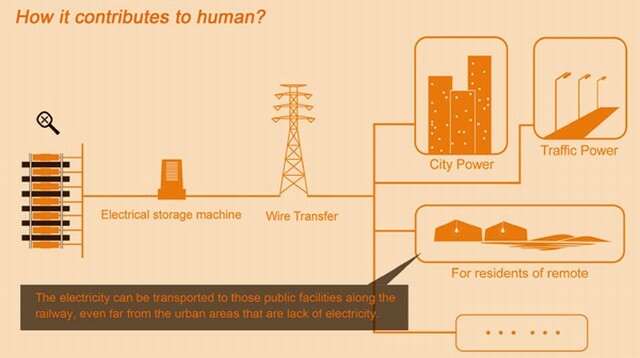 The new device could be ideal for developing countries, because it is capable of solving many of the electricity problems occurring in such places. To fix the T-box on the rails, the concaves must to be constructed in cement between every two sleepers. After that, two brackets are to be fixed on two sides of the concave. This way the new device can be set upon these maneuvered tracks. About 150 T-boxes could be assembled on a 1000 m long railway track. 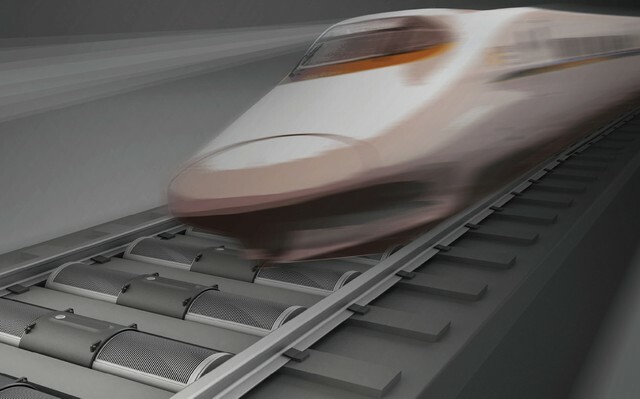 A train that runs with a speed of around 200 kph would produce a wind speed equivalent to 15 m/sec. In such conditions, a normal wind power generator can produce about 3500 W of power. Generally speaking, a train (200 m long) running at a speed of 300 kph, is able to travel a railway track (1000m long) in 18 sec. 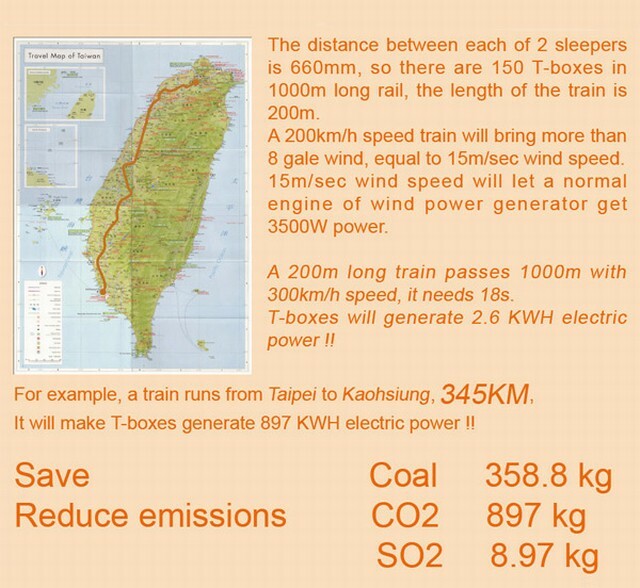 The electricity produced by the T-boxes would be of about 2.6 KWh.